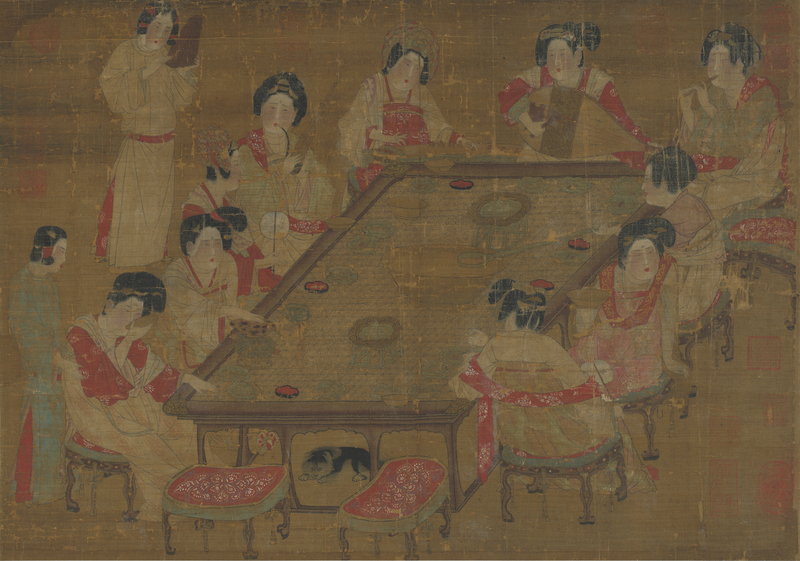 This painting shows ten ladies of the inner court sitting around a large rectangular table. Some enjoy tea, while others drink wine. The four figures at the far end seem to be responsible for playing music and livening up the atmosphere. The instruments that they hold, from left to right, are bamboo pipes, zither, lute, and flute. The two standing figures are servant girls; the one in back plays a clapper to keep beat. The melodic and elegant music almost seems to intoxicate the figures, judging from their expressions. Even the small dog under the table seems undisturbed. This work bears no seal or signature of the artist. However, the original title slip reads, "Picture of A Palace Concert by a Yuan [1279-1368] Artist." Close examination of the hairstyles shows that some are combed in one direction on top (so-called "falling topknots"), while others are combed in two directions and tied into knots by the ears ("side knots"). With different hair ornaments, one of them even wears a "floral headdress." These all correlate with ladies' fashions in the T'ang dynasty. The woven bamboo-top table, cusped crescent stools, winged wine cups, and the way the lute is being played with a large pick all accord with late T'ang customs. For these reasons, this painting ought to be reattributed to the T'ang.